CNL Financial Group, Inc. was started in 1973 by James M. Seneff, Jr. In 2004, CNL created what would become CNL Lifestyle Properties, Inc. (then CNL Income Properties, Inc.). The concept behind this real estate investment trust was to purchase recreational facilities, then lease them to operators, who would cover taxes, insurance, and maintenance. The fund plans to discontinue the sale of new shares on April 9, 2011. On December 22, 2005, CNL Lifestyle Properties, Inc. purchased Gatlinburg Sky Lift, TN, and Cypress Mountain, BC from Boyne USA Resorts for $47.5 million, leasing both back to Boyne for operational control. CNL Lifestyle Properties, Inc. acquired its first New Hampshire property on June 28, 2006 with the purchase of the Mount Washington Hotel, the Bretton Arms Country Inn, The Lodge at Bretton Woods, and the Bretton Woods Ski Area for $45 million and an additional $40 million for the golf course and development rights. On January 9, 2007, CNL Lifestyle Properties, Inc. purchased Brighton Ski Resort, UT, from Boyne USA Resorts for $35 million. Boyne then agreed to a 20 year lease with four additional 5 year options. On January 19, 2007, CNL Lifestyle Poperties, Inc. purchased Northstar-at-Tahoe, CA, Sierra-at-Tahoe, CA, Summit-at-Snoqualmie, WA, and Loon Mountain, NH, from Booth Creek Ski Holdings, Inc. for $170 million. On June 29, 2007, CNL Lifestyle Properties, Inc. purchased Mountain High Ski Resort, CA, for $45 million. Mountain High Resort Associates, LLC then agreed to lease back the area for 20 years, along with two 10 year options. On August 8, 2007, CNL Lifestyle Properties, Inc. purchased Sunday River, ME, and Sugarloaf, ME, from Boyne USA Resorts for $76.5 million (immediately following Boyne USA Resorts buying the areas from American Skiing Company). Boyne USA Resorts then leased the two areas from CNL Lifestyle Properties, Inc., through 2026, with additional option years. On Ocotber 5, 2007, Booth Creek Ski Holdings, Inc. transferred the operational leases of Summit-at-Snoqualmie, WA and Loon Mountain, NH, to Boyne USA Resorts. On September 23, 2008, CNL Lifestyle Properties, Inc. agreed to loan Boyne USA Resorts $68 million for development use at Big Sky, MT. In addition, CNL acquired the option to purchase the ski area outright, with Boyne USA Resorts maintaining operational control, in September, 2010 for $74 million. On December 5, 2008, CNL Lifestyle Properties, Inc. purchased Crested Butte, CO, Okemo, VT, and the assets of Mt. Sunapee, NH, from Triple Peaks, LLC for $132 million. Triple Peaks, LLC then entered into an agreement to lease its three areas back from CNL for 40 years, therefore continuing operational control. On January 27, 2010, CNL Lifestyle Properties, Inc. purchased Jiminy Peak, MA for $27 million, leasing operational control back to Jiminy Peak Mountain Resort LLC for a 40 year term. 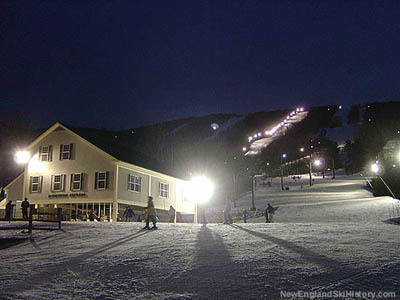 On June 15, 2010, CNL Lifestyle Properties, Inc. agreed to provide an additional $7 million in financing to CMR Properties, LLC for Cranmore to go along with $8.8 million previously loaned to Booth Creek Ski Holdings, Inc., allowing Booth Creek to sell Cranmore to CMR, the operators of Jiminy Peak. CNL was closed to new investments on April 9, 2011. On November 18, 2011, CNL Lifestyle Properties, Inc. announced it had acquired Stevens Pass, WA for $20.5 million. As required under by its articles of incorporation, CNL Lifestyle Properties began a process to provide stockholders with liquidity of their investment by December 31, 2015. As such, in 2014 CNL sold its golf and nursing home holdings over over $1 billion. In 2015, reports emerged that its ski holdings could be sold soon. On December 1, 2015, CNL sold Bretton Woods and associated properties to Omni Hotels & Resorts for $90.5 million. On April 6, 2017, EPR Properties and Ski Resort Holdings, LLC acquired CNL's remaining ski area portfolio for $810.7 million.